The note was on vellum, pierced by the talons of the almost-crow that delivered it. Karou read the message. 'He never says please', she sighed, but she gathered up her things. When Brimstone called, she always came." Although I was intrigued by the book before reading it, I had been putting it off as I went through a bit of an "avoiding YA books because I'm an adult" phase. I'm so pleased I got over that! While it is aimed at young adults, the main character is old for her age so it had a different feel to other books in this genre that I have read. I fell in love with this book and the characters right from the start. It is about Karou, a blue-haired, 17 year old girl living in Prague who is trying to juggle two lives; one normal in this world where she is an art student and the other where she runs errands for a monstrous creature called Brimstone and is surrounded by fantastical creatures called chimaera. There is a lot about her past and present that she doesn't know so she has a sense of feeling incomplete. 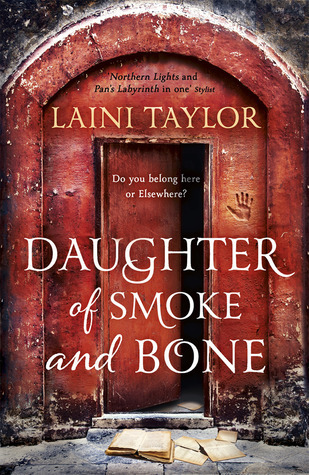 The descriptions of the characters is great and I could really imagine what they looked like - I bet the people who like drawing fan art will have a field day on Laini Taylor's creations! They were all really interesting too and I liked their uniqueness's. I especially felt drawn into the setting in Prague as only the week before I read the book I had visited there so I was able to really visualise where Karou and the other characters were and what they were seeing and experiencing. I have since read the two follow up books in the series, Days of Blood & Starlight and Dreams of Gods & Monsters which I will post reviews for at a later date.